Washington — March 16, 2015 … U.S. Senator Ted Cruz, R-Texas, and U.S. 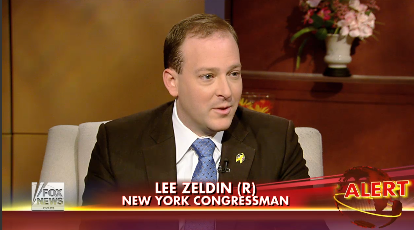 Congressman Lee Zeldin, have sent a letter to IRS Commissioner John Koskinen asking for information regarding the tax-exempt status of The PeaceWorks Network Foundation, most commonly known by the name “OneVoice,” after several media reports indicating OneVoice, a tax-exempt 501(c)(3) organization, has been using its resources to influence the outcome of the upcoming Israeli elections. “It’s abundantly clear that OneVoice, a U.S. taxpayer funded 501(c)(3), is fully engaged in political activities to oust the Israeli Prime Minister,” said Rep. Zeldin. As specified in the letter, a recent article in the Israeli ultra Left wing newspaper Haaretz reports that a U.S. taxpayer-funded non-profit organization called OneVoice is actively working with a campaign operation called Victory 2015 (V15) in an effort to influence the upcoming elections in Israel on March 17, 2015. Preserve all documents and records, including e-mail, e-mail-based calendar appointments, electronic documents, and other electronic data (electronic records), created since the date of The PeaceWorks Network Foundation’s request for non-profit organization status under Section 501(c)(3) of the Internal Revenue Code that relate to OneVoice. For the purposes of this request, “preserve” means taking reasonable steps to prevent the partial or full destruction, alteration, testing, deletion, shredding, incineration, wiping, relocation, migration, theft, or mutation of electronic records, as well as negligent or intentional handling that would make such records incomplete or inaccessible. Exercise reasonable efforts to identify and notify former Treasury employees and contractors, subcontractors, and consultants who may have access to such electronic records that they are also to be preserved. If it is the routine practice of any Treasury component, employee, or contractor to destroy or otherwise alter such electronic records, either halt such practices immediately, or arrange for the preservation of complete and accurate duplicates or copies of such records, suitable for production if requested. A copy of The PeaceWorks Network Foundation’s Section 501(c)(3) application (or the Section 501(c)(3) application of any component or subsidiary organizations’ of The PeaceWorks Network Foundation, including any of the “OneVoice” organizations’). A copy of The PeaceWorks Network Foundation’s (or any component or subsidiary organizations’, including any of the “OneVoice” organizations’) Internal Revenue Service Form 1023 and related documentation. IRS’s position on whether The PeaceWorks Network Foundation’s (or any component or subsidiary organizations’, including any of the “OneVoice” organizations’) activities, as discussed in the provided public domain news accounts, indicate that the organization may be engaged in political activity. IRS’s position on whether it considers The PeaceWorks Network Foundation’s (or any component or subsidiary organizations’, including any of the “OneVoice” organizations’) political activities violate its tax-exempt status as a non-profit organization under 26 U.S.C. 501(c)(3). IRS’s position on whether The PeaceWorks Network Foundation’s (or any component or subsidiary organizations’, including any of the “OneVoice” organizations’) activities, including its partnership with the foreign campaign organization known as Victory 2015 (V15) violate either Section 501(c)(3) of the Internal Revenue Code, any other provision of the Internal Revenue Code, or any other federal statute or regulation. Any additional information in IRS’s possession about how The PeaceWorks Network Foundation (or any component or subsidiary organizations, including any of the “OneVoice” organizations) spends its funds, including any voluntary or involuntary financial reporting information. What, if any, steps the IRS is taking to investigate The PeaceWorks Network Foundation’s (or any component or subsidiary organizations’, including any of the “OneVoice” organizations’) potential engagement in political activities, as described above.